The five-gallery year-long “California Dreaming” exhibition opened yesterday, 11 April 2014, at Museo Ferrari Marranello as a highlight of Ferrari SpA’s million-euro redevelopment program to better welcome visitors to the Ferrari museum that last year numbered 320,000 enthusiasts from around the world. Officiating at the special ceremony were Ferrari president Luca di Montezemolo and the mayor of Maranello, Lucia Bursi. “California Dreaming” features historic artifacts, photographs and significant Ferraris that tell the stories of Ferrari racing in the United States, the legends of Laguna Seca, Rodeo Drive and Beverly Hills, Ferraris at Pebble Beach, along with Ferraris in Hollywood movies and today’s Silicon Valley technology. 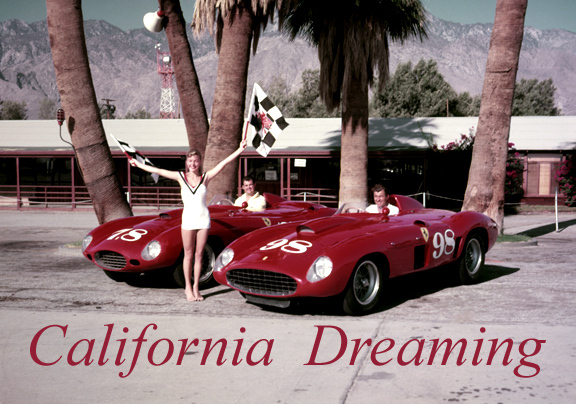 Helping to dramatize and decorate the “California Dreaming” exhibition are wall mural background displays that include a number of period 1950s black-&-white and color photographs selected and licensed from the Edgar Motorsport Archive. Concurrent with the opening of “California Dreaming” is my 8-page illustrated feature article “Ferrari’s American Spirit” in the latest issue #24 of The Official Ferrari Magazine. This entry was posted in Uncategorized and tagged Carroll Shelby, Jack McAfee, Museo Ferrari Marranello. Bookmark the permalink.